This is a rag rug playground! 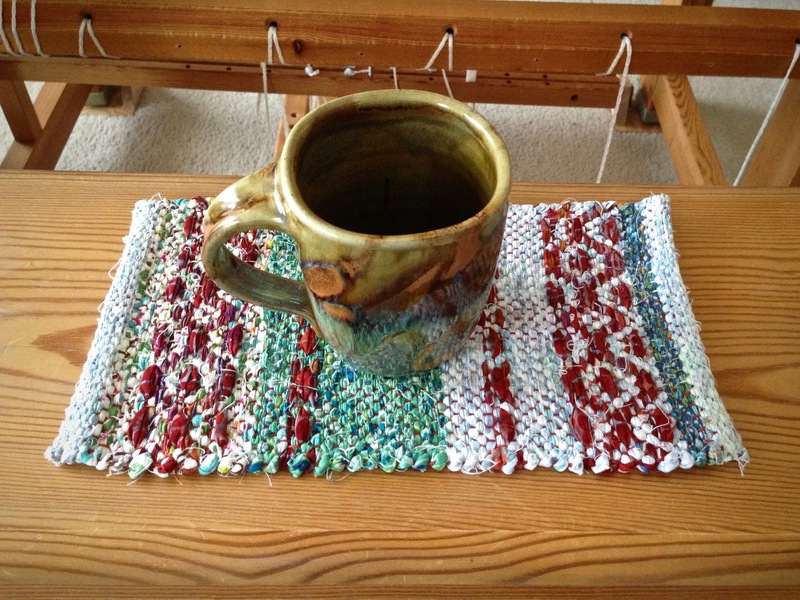 I am weaving miniature rugs—rosepath rag rug hot pads. My small countermarch loom is perfect for this exploration. Without tabby or with tabby? 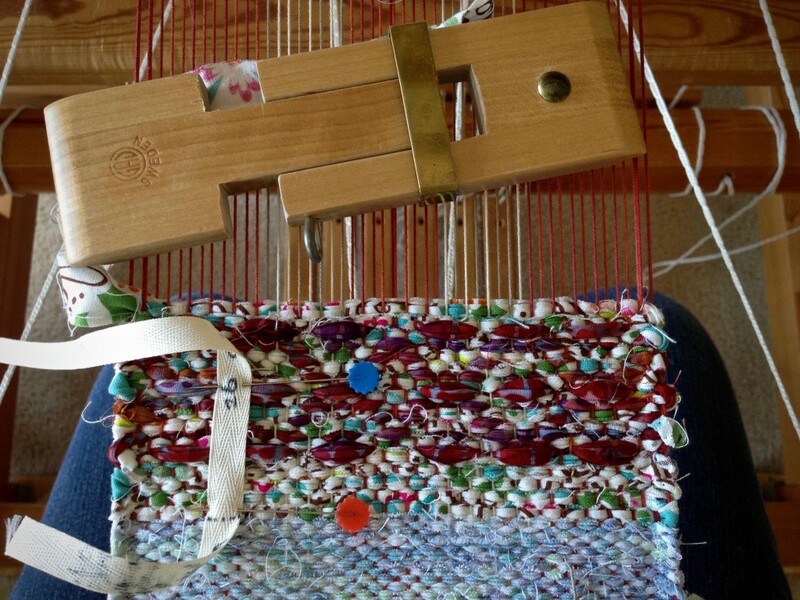 Planned weft or hit and miss? Vibrant colors or soft neutrals? 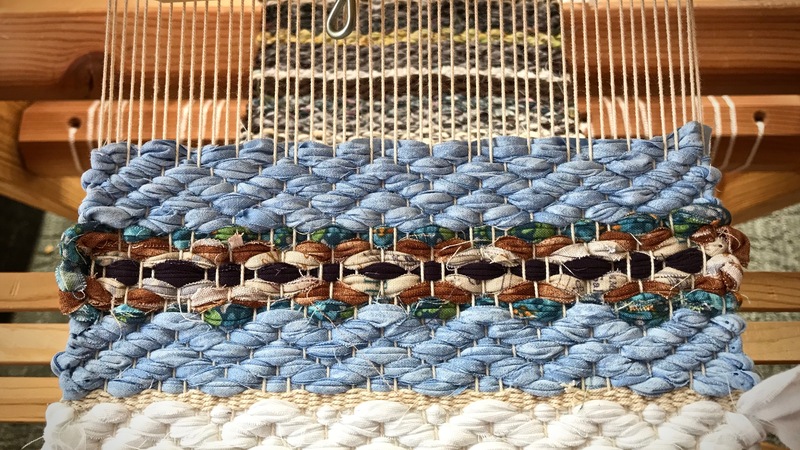 Weft inlay or plain and simple? So many possibilities! My “idea bank” is exploding. Reverse treadling adds a diamond design element at both ends of this mini rug. Color choices are inspired by views outside this Texas hill country window. My goal is to weave as many different versions as possible. No two alike! Sure, they all have the same 12/9 cotton warp and all-cotton-fabric-strips weft, but with all sorts of variations. Most will be gifts. 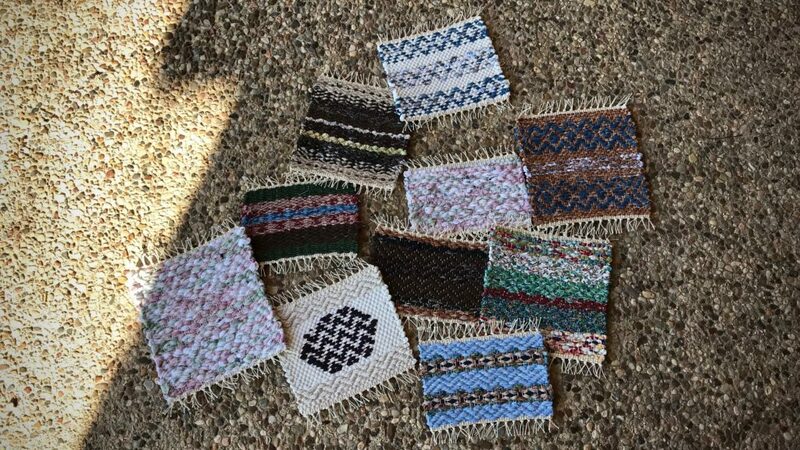 Handwoven hot pads, making it to the kitchens of friends, to serve them well. 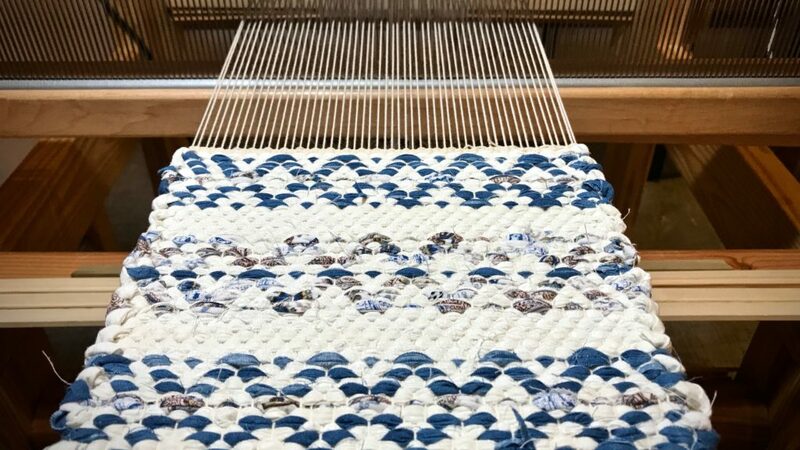 White fabric strips are used as tabby weft to highlight the blue rosepath pattern. Deep purple fabric strip is used for weft rosepath inlay over a plain weave background. Woven hot pads wind their way around the cloth beam, separated by scrap weft and warping slats. There is no one like you, with your hopes, dreams, and pains. You touch others like no one else can. Your life makes a difference. Your life matters because it matters to God. Your Creator had good things in mind when he formed you. Lord, place us where we will best show your handiwork, where we can humbly serve those you’ve given us to love. May you live on purpose. Hi Angela, I appreciate your kind thoughts! It is good to be reminded that our Heavenly Father has made us all as uniquely diverse as your hot pads. Perhaps there is the bit of the weaver in him. And I can’t quite decide which hot pad I like best! But it seems fun experimenting! 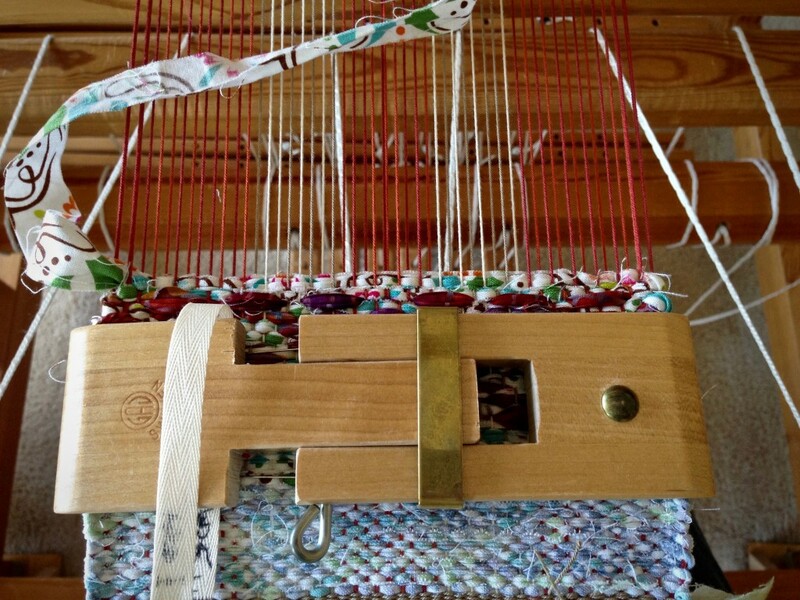 Hi Annie, It’s fun to have a project on the loom that allows for experimentation. Yes, I’d say our Heavenly Father positively has a weaver side to him. Love the variations, we want to see them laid out on the floor when you cut them off!!! Hi Gayle, Okie dokie, I can do that! Fantastic idea and I need some office gifts!! How do you finish your ends? Hi Janet, I plan to tie the ends into overhand knots and then trim them to about 1/4-3/8″ or so. I could have woven hems on them with thin fabric strips and then turn the hems under and stitch, but I haven’t done that this time. 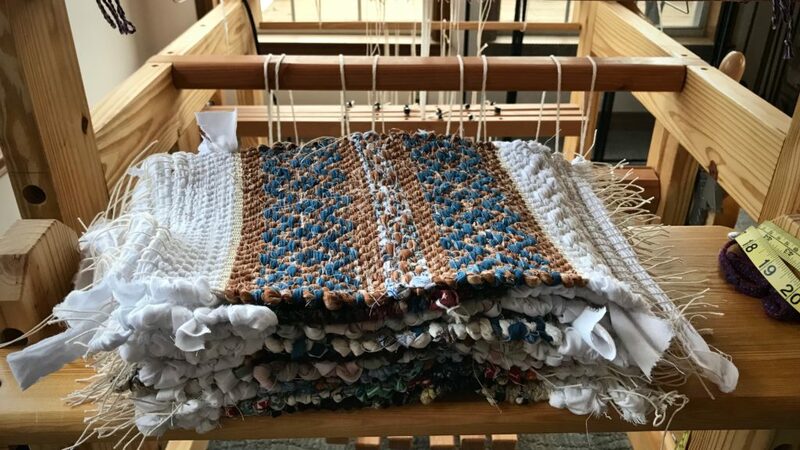 It’s possible to bind the edges (after tying knots) with fabric, but that doesn’t always stay looking great, especially if they are washed frequently. These weave up nice and fast! …Besides being so much fun to do. Great idea for office gifts! One more thing… If you plan to tie knots, it is helpful to have at least 4 inches of warp for tying. 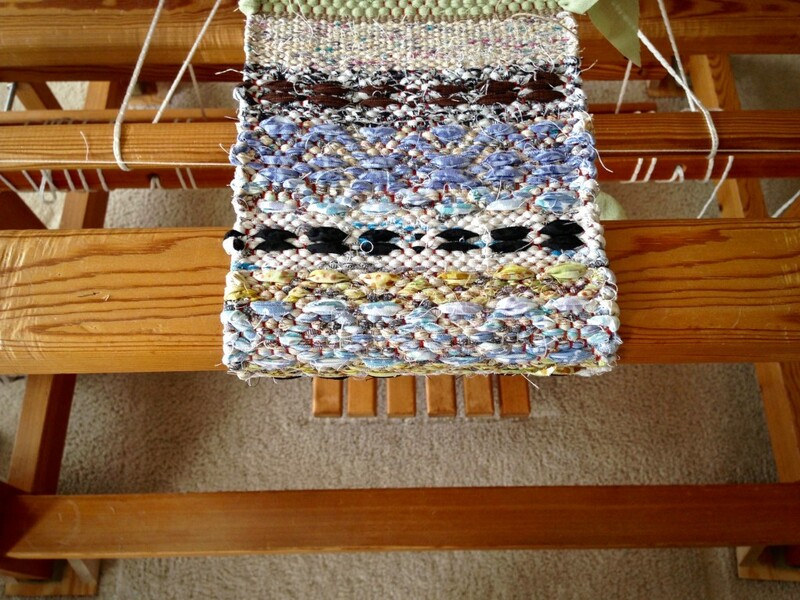 So I try to put about 8″ between mats, with scrap weft and slats. You can tie knots with less than 4″, but it can get a little tricky. I always regret it when I shorten the distance to try to save warp. These are beautiful! 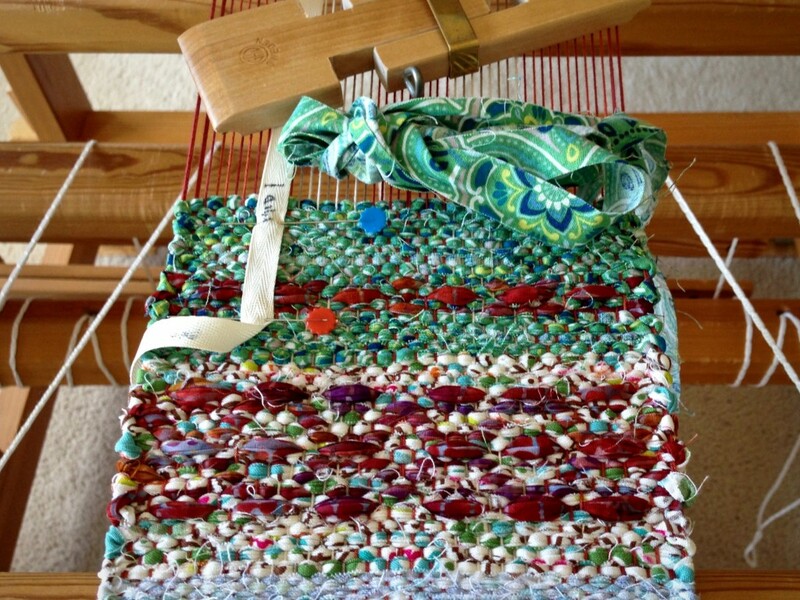 What a wonderful way to play with new patterns and colors while using up fabric scraps. Plus, they’re very useful! Thank you for sharing. I always look forward to your blog posts!! Hi Kathryn, I wish I could tell you how long the warp is. This started as a tapestry/inlay project. After finishing the first of four panels, I decided I didn’t want to weave three more. The original warp was probably about 5 or 6 yards. 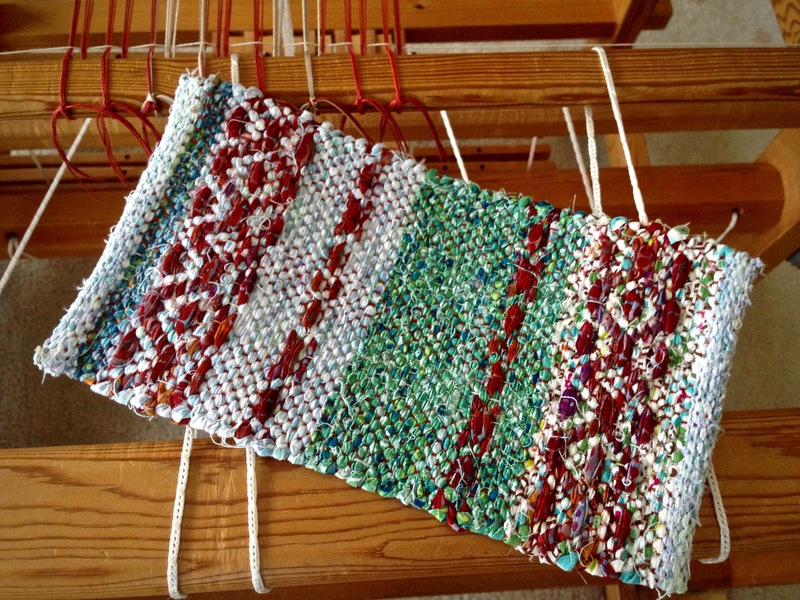 Instead of cutting off the rest of the warp, I decided to do something fun and easy – hot pads! I have not been counting, so I can’t even tell you how many I have so far – maybe 6 or 8. And I’m guessing I’ll get 3 or 4 more. I think wool fabric would be a great choice for hot pads. I didn’t know about wool being naturally fire retardant. That’s good to know! Thanks for asking great questions! What is the sett on these beautiful rugs? What size reed are you using? Hi Limor, The sett is approximately 6 epi. I’m using a metric 25/10 reed, the rough equivalent of which is a 6-dent reed. One end per heddle, and one end per dent. Weaving rosepath is not difficult, but it requires concentration. Similar to overshot, this rosepath is woven over a plain weave ground, meaning alternating wefts that keep me on my toes. 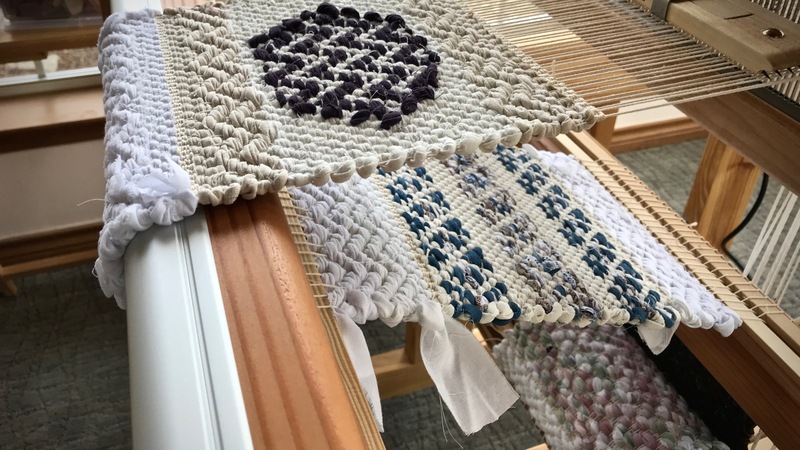 Exactly the kind of fascinating weaving experience that I love! Low contrast in colors makes a subtle rosepath pattern. The black and brown dashes are formed by using just one of the pattern treadles. 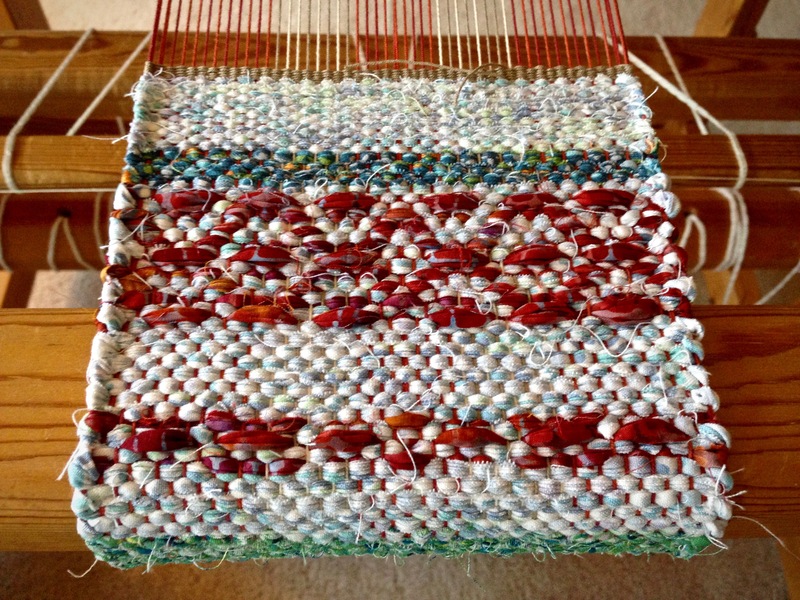 I like to weave when I have things on my mind, when there are issues to think through. 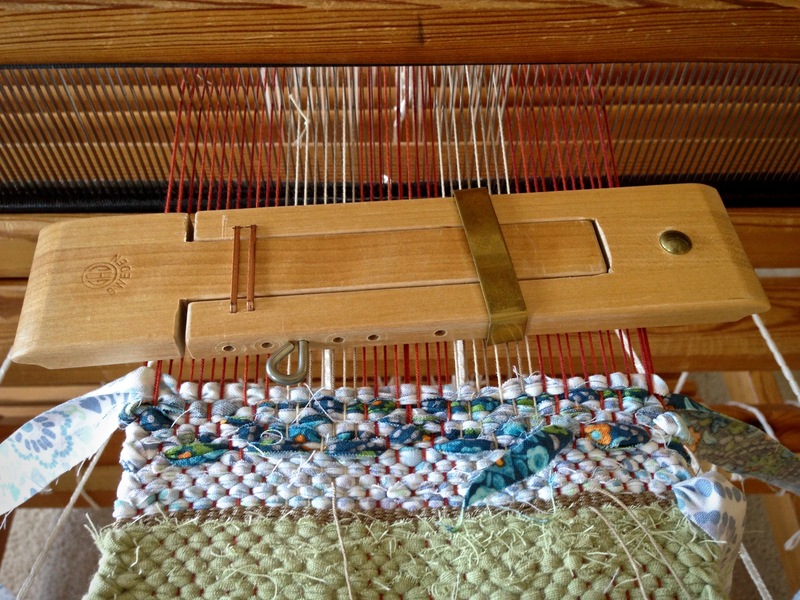 I give full attention to the weaving–placing weft, stepping on treadles, and staying mindful of the pattern. Creative energy at its best. 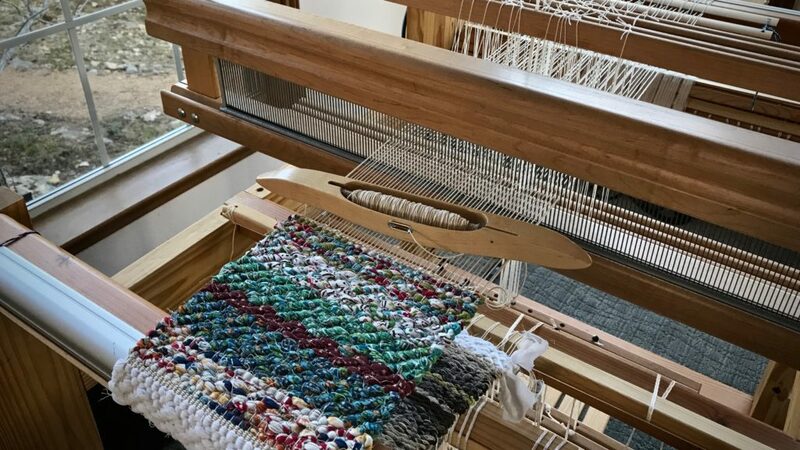 When I get immersed in what’s happening on the loom, the storms of life take a back seat. They don’t go away, but they seem to fade for the time being. Life brings storms. When my refuge is God in times of trouble, and when I turn to Him for strength, fear blows away. We have a shelter in the storm. A place to come in from the weather outside and rest. It’s like sitting at the loom, only better. It’s sinking into the arms of a loving Father. May you have a place to come in from the storm. 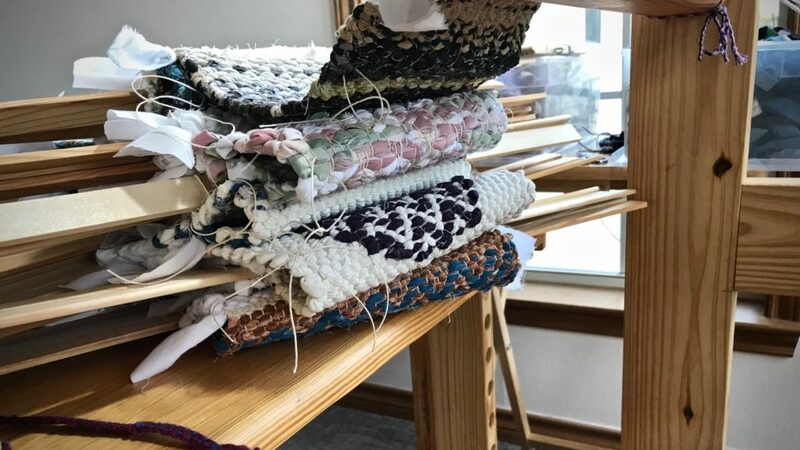 What if you start weaving a project and realize your smallest temple is too big? And that your smallest temple is the smallest one they make. I am aware that most people do not use a temple for something this narrow, 16.7 cm/6.5 in. 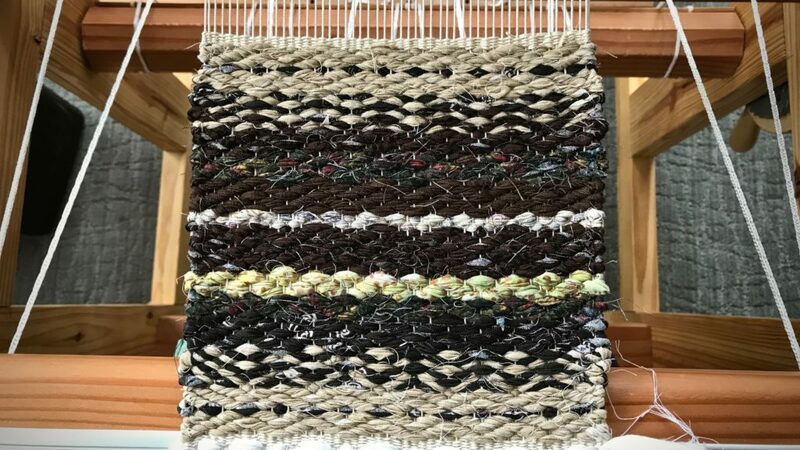 width in the reed, but this is a rag rug. A miniature rosepath rag rug. And draw-in is inevitable, which leads to weaving headaches like broken selvedge warp ends. A temple helps prevent all that. Smallest Glimåkra temple is two inches wider than my weaving width. Measure twice; cut once. 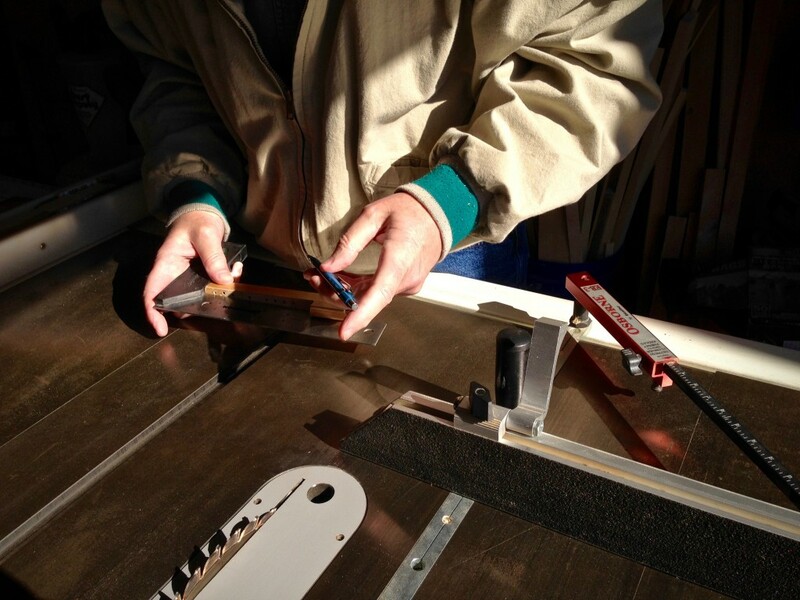 Steve marks his cutting lines on the original temple parts. 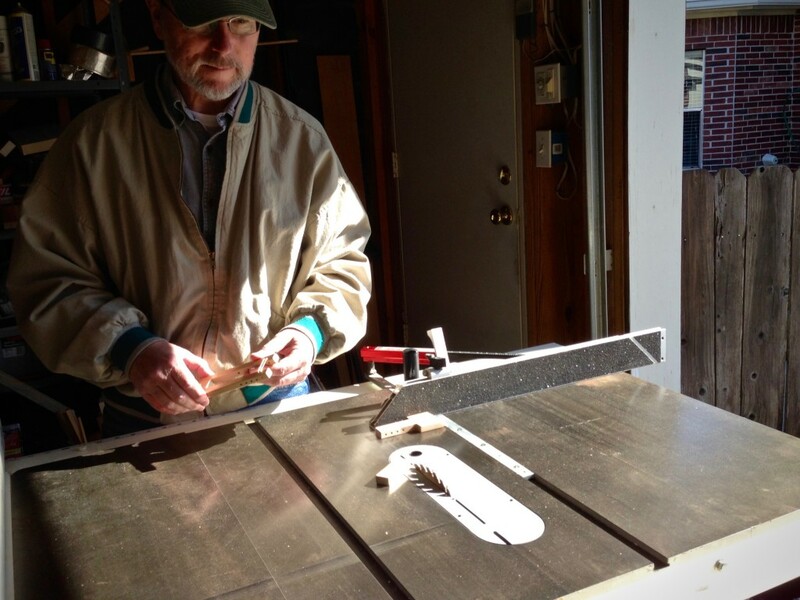 Happy with the first cut, Steve is now ready to let the second piece meet the saw blade. Perfect! It works! 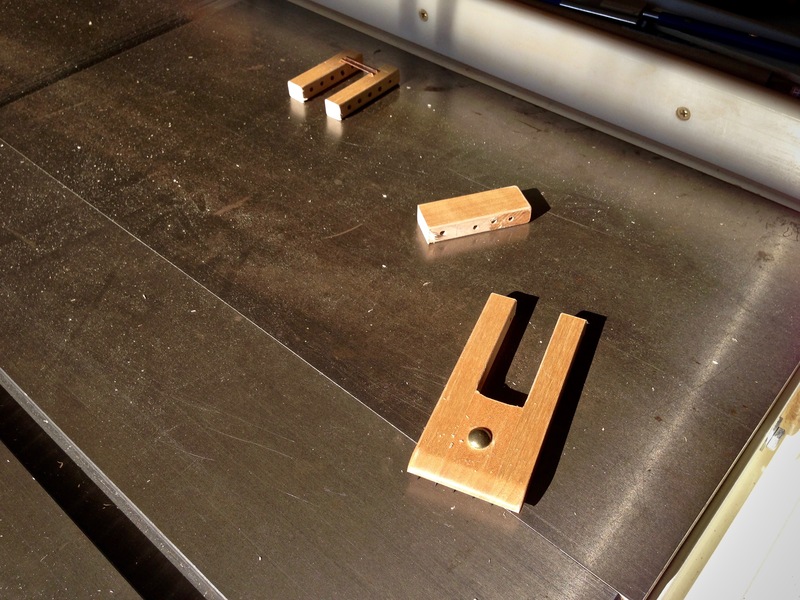 And holes for the locking pin line up, too! Teeny tiny temple does its job. Yay! Start of a miniature rosepath rag rug. May you cut your problems down to size. You have a real sweet husband. I enjoy reading your blog. Something positive that gives me a little lift every day. Keep up the good work. I am very thankful for my sweet husband. And I’m thankful for your encouragement! I’m so glad to have you in the journey with me. I can sew a straight seam on my sewing machine without using straight pins to hold the pieces together, but I use the pins because they are tools that help me focus on other sewing skills. I don’t have to think about the fabric shifting out of place. I see the temple as a similar tool. 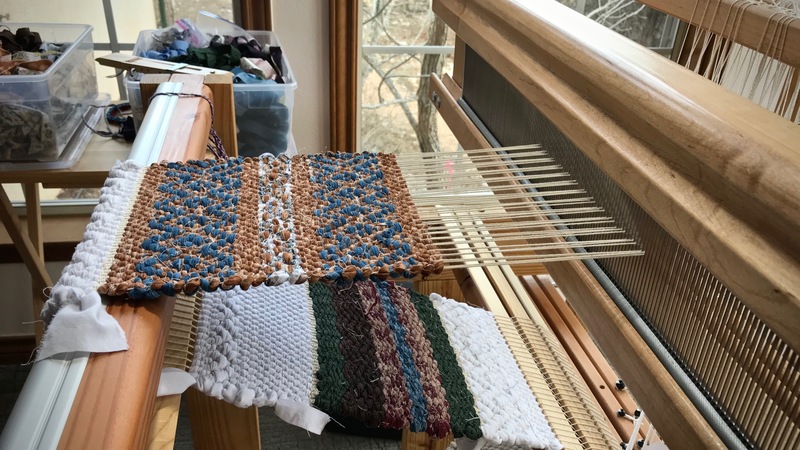 I can weave without it, but using the temple enables me to “forget” about that part and focus on other weaving skills. With rugs in particular, the temple helps me get very tight selvedges, which I consider the mark of a high quality rug. Even Jason Collingwood said he wouldn’t dream of weaving a rug without a temple. I just recently had a need for a larger temple, and, oh, was it expensive. A 60″ is a lot of money. It would be fun to see your 60″ temple next to my 6″ temple!